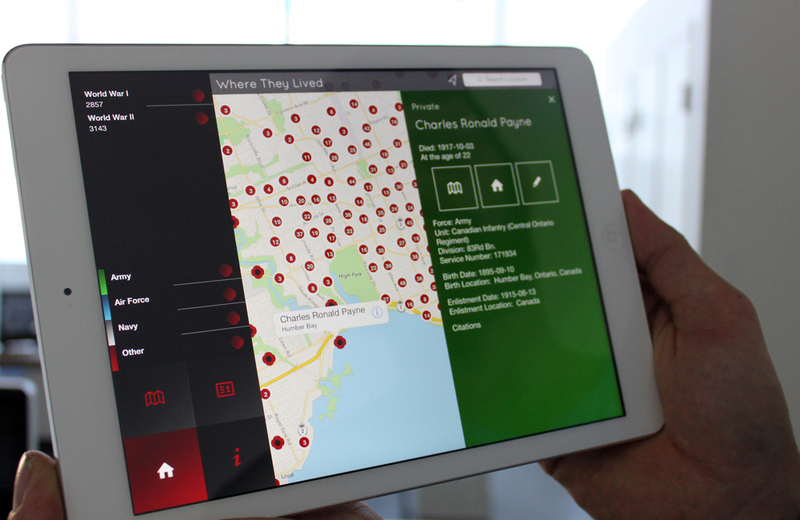 The Fallen is an interactive app, created for the iPad, giving Canadians a new way to remember those who have given their lives in service to our country from the Boer War, through the World Wars, Korean War, Peacekeeping Missions and Afghanistan. This project was born out of the desire to experiment and adapt static data for evolving media and technology. The Fallen is designed as an emotive experience through a combination of interactive maps, photography and soon to be, original storytelling. The intent of The Fallen goes beyond the app itself and is meant as an ongoing communal project, connecting Canadians across the world by sharing their stories, memories and histories. The Fallen has been met with overwhelming success across the country and abroad. With both printed and online national coverage by the Globe & Mail, The Toronto Star and the Telegraph Journal, The Fallen reached people across the country with no marketing budget. It’s founders, Sonia Chai and Tim Robertson, were interviewed on CBC’s Metro Morning to discuss the importance of creating a new way for Canadians to remember in this digital age. The Fallen was also recognized by Apple Inc. as one of the best new Apps for the iPad during the month of November 2013 and is currently nominated for a 2014 Webby Award in the Education/Research Tablet category. To date there are over 20,000 downloads of the application and we continue to receive emails from Canadians daily contributing their families stories to the project or wanting to discuss the program in more detail. Currently, there are no other tablet applications of this type, in the world. We have been approached by organizations in both France and the United Kingdom to expand the project, however our priority is to focus on ensuring the current version is delivering the best possible experience to Canadians. This is so appropriate for Remembrance Day. A very visual account of the great sacrifice that generations of Canadians have made for this country.